Make your mark with a personally designed car that’s truly your own. 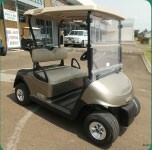 Top-of-the-line cars designed for cruising the fairway or the thoroughfare in style. Petrol and electric, 4-year warranty. Upgrade your style, upgrade your experience. Fully reconditioned golf and leisure vehicles, customised to suit your unique personality. Petrol and electric. 30 years’ experience. Six-month mobile maintenance, workshop repairs and call outs. See our full list of mobile service locations. Parts and accessories for major brands and models. If we don’t have it, we’ll get it. Batteries to rain covers, dress rims to brake shoes. Hiring may be more cost effective than buying. We offer what you need for as long as you need it, whether you’re a bride, charity, resort, retirement village, or industrial enterprise.